All of Wrangler's engines will now come standard with stop-start technology. LOS ANGELES -- The redesigned 2018 Jeep Wrangler may look strikingly similar to its immediate predecessor, but above the skid plates and beneath the removable top, longtime fans of the iconic off-roader will notice the upgrades incorporated into the first Wrangler redesign since 2006. The Wrangler is Jeep's No. 2 seller in Canada and the United States after the Cherokee and Grand Cherokee, respectively. It captures some of the most loyal and passionate owners in the auto industry. Fiat Chrysler Automobiles has been deliberate in redesigning and re-engineering everything on the venerable SUV. FCA Canada hasn't released Canadian details of the redesigned vehicle, but FCA unveiled the Wrangler and U.S. specifications at the Los Angeles Auto Show. A number of upgrades on the new JL-generation Wrangler are aimed squarely at improving fuel economy and on-road performance, starting with a standard six-speed manual transmission or optional eight-speed automatic. 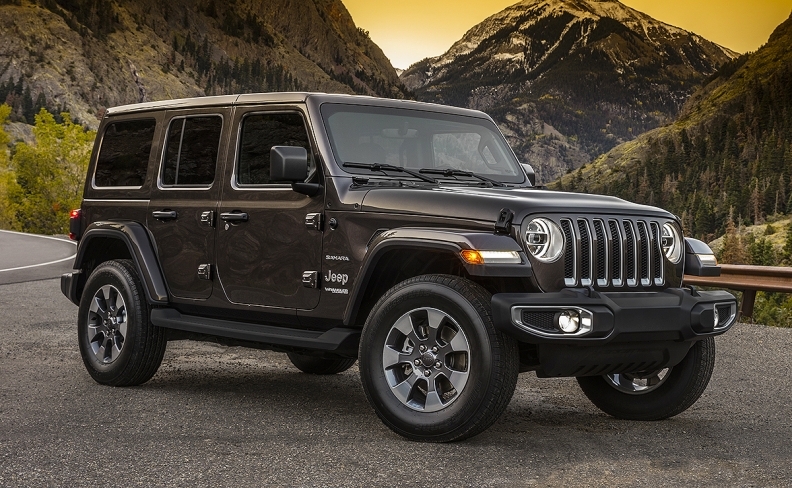 The eight-speed automatic by itself delivered a 9 percent improvement in fuel economy over the current Wrangler's five-speed automatic, according to a regulatory filing by FCA, accounting for much of the redesigned Wrangler's improved fuel economy ratings. All of Wrangler's engines will now come standard with stop-start technology, including its base 285-hp, 3.6-litre V-6 that will make 260 pound-feet of torque. A 260-hp, 3.0-litre V-6 diesel making 442 pound-feet of torque, which won't arrive until 2019 as FCA continues its ongoing legal wrangling with federal regulators over allegations of diesel emissions violations. A turbocharged 270-hp, 2.0-litre I-4 engine producing 295 pound-feet of torque. The redesigned Wrangler is getting an additional option when it comes to its transfer case. Top-end Rubicon trims will get Jeep's Rock-Trac 4x4 system, with a two-speed transfer case and a 4:1 low-range crawl ratio, while Sport and Sahara models will come equipped with the brand's Command-Trac 4x4 system, with a 2.72:1 crawl ratio. An optional full-time all-wheel-drive option will also be available on Sahara trim levels. So far, fuel economy ratings have been revealed only for the four-door Wrangler Unlimited models, which earned mpg ratings of 18 city/23 highway/20 combined with the eight-speed automatic, and 17 city/23 highway/19 combined with the six-speed manual transmission. Inside the cabin, the Wrangler's once-a-decade overhaul really takes off, starting with long-overdue upgrades of its infotainment system and information cluster. A 5-inch touchscreen will be available on the low-end Sport models, with either 7.0- or optional 8.4-inch touchscreen displays available on upper trims, including optional Apple CarPlay and Google Android Auto functionality. Top-end systems will also include new off-road performance and trail pages for the first time. The 2018 Wrangler's instrument cluster will feature either a 3.5-inch or 7-inch information screen, depending on the trim level. The Wrangler will get push-button start for the first time, while its seats will have adjustable bolster and lumbar supports. Designers also engineered new easy-to-carry handles into the Wrangler's removable doors to make them easier to take off. Visibility has been improved with larger windows, as well as a new four-bolt system that makes it easier to drop the Wrangler's windscreen, which now features a larger rake to improve aerodynamics. When the windscreen is down, drivers will still be able to use the rearview mirror, which is now mounted to a new header bar connecting the A-pillars. A new powered Sky one-touch system allows a driver to retract the Wrangler's canvas softtop with the touch of a button (Jeep says the feature won't be available until mid-2018). Jeep will make body-colored hardtops available in Rubicon and Sahara trim levels. Only the Sport and Rubicon trims will be available as two-door Wrangler models. Among the four-door Unlimited models, the trim walk is Sport, Sahara and Rubicon. Wrangler JL production is already underway in Toledo, Ohio, with soft- and dual-top four-door versions going into production beginning in December. Production of export versions will start in January and two-door JL Wrangler output is to start in mid-February. Pricing has not been announced. Production of the current JK Wrangler will end in late March to allow its assembly line to be retooled for the 2019 Jeep Scrambler, the Wrangler-based pickup, set to begin in November 2018. The 2018 JL Wrangler will begin arriving in dealer showrooms in the U.S. in January.